Correct, he’s never had it. Even here, it’s pseudo cream – really just cold, sweetened coconut milk. But I can live with his record broken at six years, four months. Tennyson has never been given candy, chocolate, jelly beans. You get the picture. Sugar weakens the immune system and feeds pathogens. Food so cold not only shocks the stomach but dampens the body, making it a lovely greenhouse for microbes. He goes on to explain a connection between the polio epidemic of the 50s in the U.S. and excess ice cream consumption. He is not the first health care practitioner to name the study where a doctor in Virginia had kids abstain from such sweets. There was practically no outbreak of polio in the VA town. The point was not to conclude that ice cream causes polio per se but that restricting the former predisposes the body to defenses even against something as frightful as polio. So Tennyson mentioned around his sixth birthday that it would be nice to try some ice cream. Mom had planned on holding out until he was eight or nine. But even she couldn’t say no this time, when the little guy’s been so good about eating differently from other kids. Am not preaching. This is just the path I’ve chosen for my boy until he can exercise discretion. Not to mention that it’s been 100 degrees all summer. This was the coldest food he’s had. Yes, I would warm it in the oven if I could. As it is, I left it out to melt a little. He asked for it on a cone – next time. This entry was posted in Holistic Health and tagged Children, Family, Food, Health, Nutrition, Wellness. Bookmark the permalink. Very informative! But permit me to ask you to help me a lil’; Is your counsel that Organic ice-cream should be consumed instead or none should be consumed at all? Thanks dear. I’ve a better understanding now. Just because something is christened “organic” it doesn’t mean it’s much better than not. I can’t build it as hoped. This Journey has taken off and I don’t want to pull back. The Table is now more a reference for those who’re interested. Please see the pages on top of the blog. Hope it’s useful. Mom? ice cream is a gift! OK, its a vice of mine. =) I did say I wasn’t preaching. If I were, come to think of it, I probably would lose all my followers. Reblogged this on My Holistic Table. We’ve all been on the GAPs diet at our house, for the past 12 months. 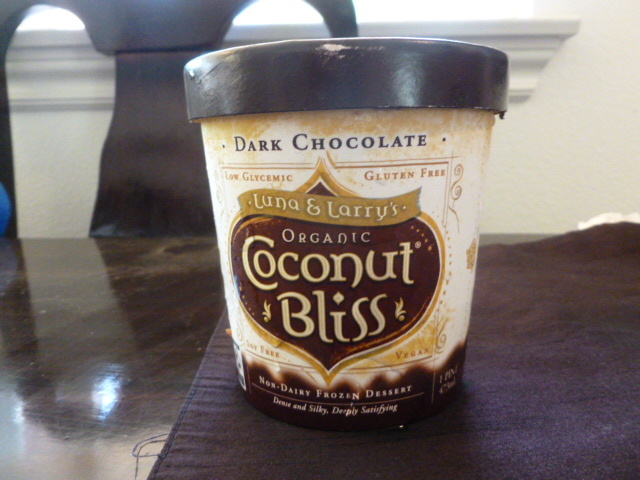 So the only kind of ice cream we’ve had has been made from coconut milk. Really, so much of what we eat as a society is crazy and has nothing to do with nutrition. It’s hard not to despair sometimes, especially when you want to feed your children a healthy diet, while meanwhile advertising and cultural norms conspire to force biological and chemical garbage onto them. So our fellowship deepens. Thanks for opening that window for me! We don’t watch TV. The cultural norms really can make it nearly impossible but he’s been such a good boy. Just knows we’re different, and that’s that. He’s also been enrolled in Integrative Nutrition 101 since birth, so hears day in, day out how to chew, why the greens and the colors on the plate, etc. I honestly believe everything should be down in modernization ~ don’t you? Terrific info! Many things, yes. In fact, excess can become its reverse. But I know what I do about sugar and frozen foods and digestion and indigestion that I feel it best to avoid some things altogether. =) and =( Aye, I actually understand what you suffered. Thanks for piping in. It’s awesome to learn who’s with me in the day to day eating! And the affirmation is admittedly nice. I’m sure many just think I deprive my son. Your son may rebel, but some day he will probably return to clean eating. Yes, society is judgemental to those of us who care. I hate hearing parents ‘reward’ good behavior at the library with the golden arches! Well, I explain and instruct, and reason. Dictatorship earns rebellion. Hopefully he’ll come to exercise good judgment. Don’t get me started on them arches. Angela, I think you’ll take to the site I shared with glaxforio (comment above yours). Be sure to chk out the Wonder Years. This makes me so sad. I love ice cream. I try to ‘eat clean,’ but I definitely cheat a lot. So sad to hear ice cream is that bad for you? I’ve had coconut milk before (SO brand) – it was yummy. Is that better? I so appreciate the important info…even though ice cream will never be the same again! Frozen yogurt?? Laughing from both your comments, Kate. Please see my responses to glaxforio (first comment that came in). Be sure to chk out the Wonder Years page on the food blog. You’ll see what I mean. As to TJ’s, though I keep that store running, I shop very (vEry) selectively there. You have to. Much of the inventory is actually run-of-the-mill stuff with the wholesome-seeming TJ label. You’re welcome to send me the ingredients on the SO. I couldn’t deconstruct it from memory. I salute your stand in no candies and sugar stuff for kids. I’m not a fan of candies too but rarely my son gets one because of his mom. I tried his Halloween treats with a dollar toys from Dollar Tree. Have a great week. A bit surprised – but pleased – at your reaction, Carly. Thought you’d just think me an ogre of a mom. And it’s not a vivid recollection, but I believe the brand IS as good as it looks. He’s adorable! Very interesting and informative post. Very informative – I never heard of ice cream posing any danger other than being fattening. You’ve sparked my curiosity to do more research on the matter. LOL. Well, some things you just gotta learn the hard way, eh? You might want to chk out my responses to Glaxforio – a comment above yours. There’s a lot of info for curious folks, on eating in gen’l. It nice to see a mother so engaged with her child and their health. I wish my children had never consumed sugar, candy, fast food. They consume a lot less than other children. Way less. But I have waffled over the years, due to my own yo-yo-ing between being a super health nut and giving in to the surrounding pressure (in-laws, husband) As a person with auto-immune issues, I personally cannot eat like most people and really suffer when I do. So, I’m back to making those changes little by little with me and my kids (hopefully, hubby will follow). I am even ambitiously considering sending lunch to school. Very interesting about the freezing process and our bodies. I’ve been learning a lot about nutrition lately and it’s amazing how much I thought I knew, but was wrong. Thanks for the feedback, Denise. Sounds like you’ll take to the food blog I told Glaxforio about. One of the first comments on this post. Blessings. Surely a little ice cream wouldn’t hurt the little guy. Instead of booze he’s gonna be binging on Ben & Jerry’s once he gets to college. As I mentioned in a comment response on that post, I have done my darnedest not to raise him slapping his hand all the time but educating him in the better way so he can make wise decisions down the road (which yes, he will think a rocky road LOL at times) but interesting, isn’t it: he hasn’t mentioned the ice cream since. I didn’t know a THING about sugar, all its damage. I had zero idea. Very very interesting. Sugar is the worst thing for you. Esp growing bodies. Sounds like you’ll want to chk out myholistictable.wordpress.com. Sugar also feeds depression and a host of pathologies along with pathogens. I adore ice cream. Fascinating info! =) Sugar feeds depression, too…. This whole damn world feeds depression, gentle sis. Please don’t take my ice cream away. Hi Holistic Wayfarer. Thank you for finding my poem ‘ Drift Wood!’ Best Wishes, The Foureyed poet. I certainly related to this post. I’m a vegan and on calorie restriction too. All children are different and some will react to a strict nutritional regime by wanting to try other foods at the first opportunity. It was certainly much easier when we were home schooling but now our teenage daughter eats what she wants and it’s not that healthy but also not that unhealthy. I can only hope that as she gets older she will remember what she has learned about good nutrition. The boy is adorable, first of all and two, I like your style of writing. Concise, factual and passionate. Thank you so much for the specific feedback and the time here, Foghorn. Blessings.